Read it and weep. Or maybe I should say look at it and weep. I suppose this is a good time to recycle my flat tax video. I don’t mention this in the video, but Hong Kong’s flat tax system, which has been around for more than 60 years, requires less than 200 pages. Slovakia’s flat tax law is thinner than a magazine. Karl Landgren, have you ever read subtitle A and subtitle C of 26 U.S.C.? If you had, you would quickly realize that there is no liability for the federal income tax and you would see that only federal employees can be made subject to the tax when they volunteer by agreement with their employer. Congressman Dennis A. Ross of the 15th District of Florida has stated in a personal letter to one of his constituents that the current tax code does not state individual American’s liability for payment of federal taxes. So why do you want any other tax to replace the income tax? Above the Code of 26 U.S.C. is the Constitution which protects American citizens at Article 1, section 2, clause 3, section 9, clause 4, which has not been repealed. The Flat tax would be vastly better than the diabolical monstrosity we currently suffer under. The FairTax (sales tax) will be even better, for several reasons. American’s in general are just plain ignorant of tax law. American’s forget that they are protected by the Constitution, the highest law of the land. They can’t open the tax code of 26 U.S.C. and read that nowhere in all of subtitle A is anyone made liable for the income tax. Even Congressman Dennis A. Ross of the 15th District of Florida, admits that the current tax code does not state individual American’s liability for payment of federal taxes. This statement by the congressman, aligns with subtitle C of 26 U.S.C., where it defines a “employee” as that of a federal worker. Only federal workers (employees) can lawfully pay the income tax voluntarily in section 3402(p) and choose not to volunteer to pay in section 3402(n). So simple, yet, nut-heads out there want a Fair Tax or a Flat Tax for everyone. So sad America has been dumbed down to the lowest of lows when it comes to taxes. The key to taxation is, you must be liable for the tax in order to owe it. How many lawyers or attorney’s out there know the tax law? Many know the law but refuse to uphold it in court because to do otherwise creates a lucrative business and keeps the corrupt system going. How about a constitutional amendment: The tax law should be no longer than can be read by a person in say ten years (or perhaps 20). This would give a very generous maximum reasonable size. 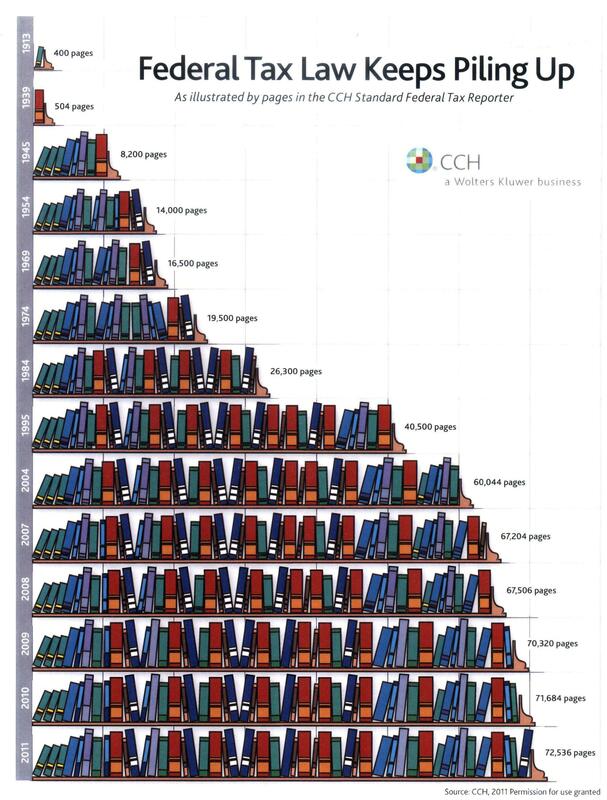 Sure, but shouldn’t the number of pages be per capita, and adjusted for inflation? Look how the founding father’s America that became at lightning speed -about half a century- the world’s superpower with less than 10% TOTAL government spending was transformed by the political class into the european style stagnated welfare state that the USA is today. The U.S. Constitution, one of the best ever made, is often not respected. And as the political class gives itself more power the U.S. Constitution will be even less respected. I think the failure of the U.S. Constitution in limiting the power of the political class shows that the ONLY solution is kicking away the arrogant sadistic political class out of our lives by allowing every law to be repealed by a referendum that the people can call at any moment it wishes. Establishing a set of very good rules -like the U.S. Constitution did- never worked long term because the U.S. Constitution left too much power to the political class. Which is why I vowed a few years ago to NEVER AGAIN vote anybody into public office who is and or ever has been an attorney — regardless of party. Corruption in our system of who pays taxes and who is allowed to avoid paying taxes! I’m shocked, shocked that our politicians would game the system to their own personal advantage at the expense of the rest of us. Cui bono? It is past time to get the lawyers out of the legislature. Until that happens, we will never succeed in simplifying the tax code or re-allocating power to the states.